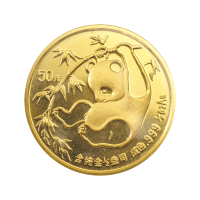 1/2oz 1985 Chinese Panda Gold Coin Get the best price online when you purchase a 1/2 oz 1985 Chinese panda gold coin from our shop. These gold bullion coins consist of .999 fine gold and retain the original plastic seal from the Chinese Mint. This series of gold bullion coins depicts Chinese panda subject matter and includes fresh designs on every year’s release. This 1985 version features an adorable baby Chinese Panda hanging on a bamboo branch on the reverse. The 1/2 oz Chinese Gold Panda Coin depicts ‘The Hall of Good Harvests’ in Beijing on the obverse. The obverse also includes a legend that reads ‘People’s Republic Of China’ and the date. There’s no greater way to diversify your bullion holdings than with examples from this unique gold panda series that changes faces every year. Celebrate this Chinese heritage species with a 1/2 oz Chinese gold panda coin today!